Although capital punishment is practiced in only a relative handful of countries (140 countries have abolished it in law or in practice, according to Amnesty International), there were nearly 100 more executions around the world last year than in 2012, a 14% increase. 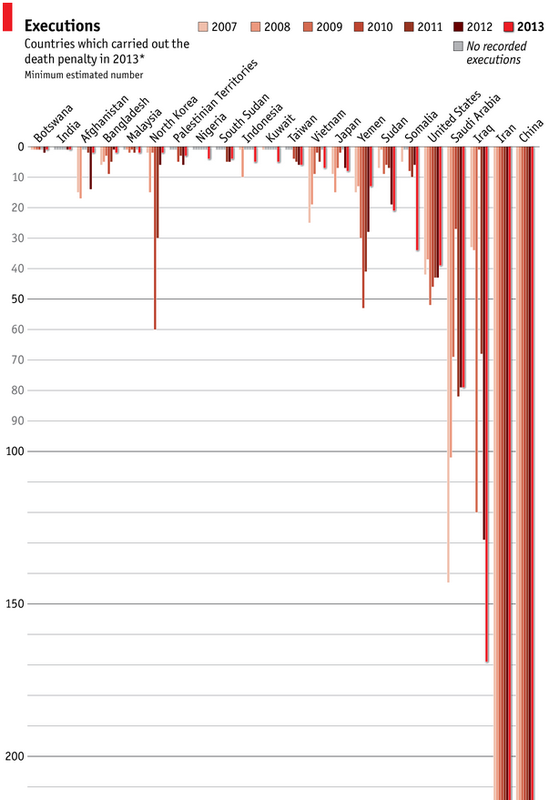 The chart above, created by The Economist based on Amnesty’s data, graphically shows that just a few countries are responsible for most executions. At least 778 executions took place last year in 22 countries, up from 682 in 2012, according to Amnesty. Several countries, including Kuwait, Nigeria, Indonesia and Vietnam resumed use of the death penalty after several years without any executions. But as the organization admits, that figure captures only a minority of all executions. Some human rights organizations believe that China executes thousands of people a year, but reliable data is difficult to obtain. Officials in Iran acknowledged 369 executions last year, Amnesty said, but “[c]redible sources pointed to many hundreds more taking place in secret, bringing the total to more than 700.” There were no estimates for Egypt or Syria. Taking third place was Iraq, where “at least” 169 people were put to death, almost one-third more than in 2012. Saudi Arabia executed 79 people last year, followed by the U.S. (39) and Somalia (34). In the U.S., the number of executions has fallen in recent years, as violent crime has dropped and a growing number of prisoners have been exonerated based on factors such as DNA evidence. The percentage of Americans who support the death penalty for murder has fallen to 55%, a low not seen in decades.